Herewith some of our latest developments and success! 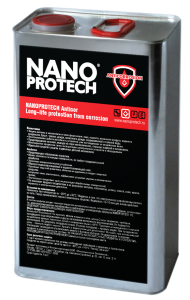 We have added the NANOPROTECH range of treatments to our portfolio. In particular the NANOPROTECH Super Anti-Corrosion provides excellent corrosion resistance to parts requiring in-situ corrosion resistance. It displaces water and seals the metal surface with a tough durable nano-structured layer. It is particularly useful for moulds and dies that have to be stored under corrosive conditions but cannot be heavily oiled. The treatment can be applied in-house. The TD Coating Centre has been granted a provisional patent (2018/02778) for our range of electrically isolated and non-conducting locating pins. 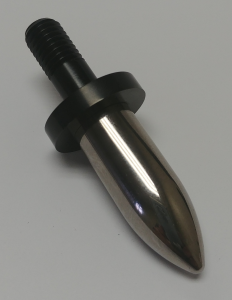 The design is such that bascially any steel tip, coated with any suitable wear resistant coating – be it TD, PVD, CVD, Nitriding, Chrome, etc – can be mounted onto a steel base but the two parts are by clever design electrically isolated from each other. 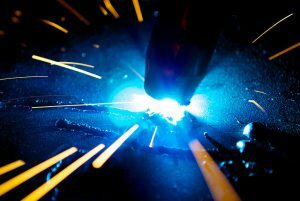 Thereby sparking as found in welding operations is avoided. 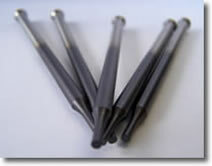 Almost any type of pin can be adapted – even the NAAMS-type pins. What does this all mean? It means that one does not have to sacrifice wear resistance for non-sparking properties. The all-steel contruction also means it's as tough as nails with no risk of shattering or snapping. Contact us for more information. We have found that 99% of the time, poor punch life can be attributed to incorrect clearance. Recently we recommended an increase in clearance by almost 3 times and just this resulted in the punch going from its normal 3 tons of work to 23 tons – and is still going strong. Each type of steel needs it's own specific clearance and using "rule of thumb" is an outdated concept. See our Fang catalogue for more on clearances. Recently stainless steel ball valves were SCN treated as the previous thermal spray coating showed premature delamination due to under-caoting corrosion. Since SCN is a diffusion process, no delamination is posssible and it also provides good corrosion resistance. The valves have been running for months and at last inspection "no wear" was evident. Zinc Flake coatings go under many properietary names such as Geomet, Magni, Delta, Dacromet, etc however our 213 provides the same excellent results with > 1000 hrs SS resistance to red rust. In hot humid coastal conditions the coating performs much better than Zinc plating. Recently a company has swapped over from Cadmium to 213 on parts that were prematurely failing due to corrosion. The result is better performance with no detrimental environmental effects. 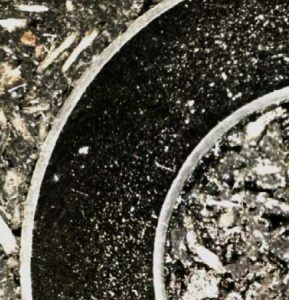 High temperature nitriding of stainless typically ruins the corrosion resistance due to the nitrogen robbing the matrix of Cr to form chromium nitrides. This is even more detrimental for duplex stainless steels where the right ratio of austenite/ferrite is important to provide excellent corrosion resistance and changing the ratio due to high temperatures will cause issues. Recently, SAF 2205 Duples SS used in seawater hydraulic systems on yachts was SCN treated to 1. provide a hard, galling resistant surface, 2. to maintain the corrosion resistance and 3. to not disturb the austenite/ferrite ratio. The parts have been running for some time now without problems. 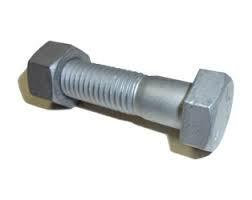 The TDCC has been supplying coated bolts, nuts and washers for armoured vehicles. These items requires salt spray resistance in excess of 1000 hrs – which was easily achieved. 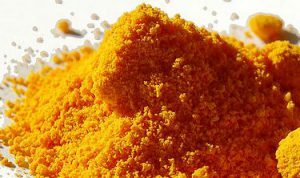 Ceric Ammonium Nitrate ((NH4)2Ce(NO3)6) or CAN is an inorganic compound and a specialized oxidising agent. It is highly corrosive though and even stainless steels suffer severe corrosion when in contact, We recently coated a vessel with a unique PTFE-based coating which proved to be highly resistant to the corrosive effect of CAN. Rather than using exotic materials to fabricate new equipment, a conventional stainless base material was used and coated at much lower cost but with exceptional corrosion resistance. Replacement of Thermal Spray: A stainless steel rotor used in the food industry that was previously thermal sprayed on the seal surfaces was succesfully replaced with a borided version. The previous issues were 1. corrosion occurring under the thermal spray layer which lead to spalling and 2. the cost of applying the thermal spray. Boriding is one of the few process that can create a super hard layer on the surface of stainless. Furthermore, it is diffused into the surface there cannot delaminate. Punching thin aluminium foil: we developed a special foil punch and die set as calculations showed that the clearances and tolerances required for conventional punching of 16 µm foil would be impossible to keep and even to make the make the parts to. The new system cuts multiple holes in the foil with no burr. 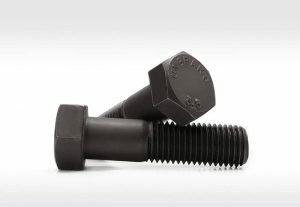 High performance punches for high strength steel: we supplied high strength, high hardness punches to an European company who punches thin, high strength spring steel. After the calculations were done, the only suitable steel was an Erasteel ASP powder metallurgy steel with a PVD coating. 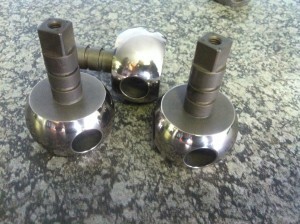 We also designed the dies for optimum clearance. So far the parts have outperformed all other parts and we're looking to further improve performance now. 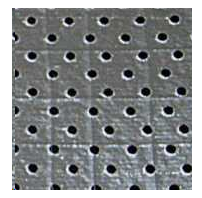 Anti Weld Spatter coatings – welding of parts result in weld spatter landing on shields which eventually lead to excessive build up and replacement of shields. The TDCC applied a Teflon based anti-spatter coating for a continuous welding line and the weld spatter easily wipe off leaving an almost new parts. The anti-spatter coating involves a special makeup which is very effective in preventing the hot spatter sticking to the surface. We are able to supply selected components for assembly and stamping to NAAMS manufacturing standards. In some cases though, the NAAMS recommended method of treatments and coatings cannot be performed in South Africa, but have been able to develop a similar product with equal or better performance.